How long would it have taken for the inhabitants of eleventh century Winsham to hear of that battle far away in Sussex? With none of our rapid methods of communication, weeks, possibly months. But eventually they would have heard that a new king, William 1, had been crowned in Westminster Abbey (that symbol of Edward the Confessor's piety) on Christmas Day 1066. Only slowly, as they continued to till their fields, take care of their stock, and struggle to survive the winter, would they have realized that a totally new era was beginning. But in 1086, when strangers came to collect information for the great survey, later known as the Doomsday Book, it became clear that a tighter and more oppressive regime had arrived. William had said, in announcing his tax survey of his whole realm, that "not an ox or a sheep shall escape the net" and how much more did this apply to the human inhabitants of England. The Manor of Winsham was not the same as the present parish: Street, Leigh and Whatley were separate manors, "held" i.e. tenanted by different overlords. The whole purpose of recording the landholding in such detail was of course to exact taxes ("geld") according to the value of the land. The Bishop referred to is the Bishop of Wells. Hides and carucates are measures of land...."Osmund holds of the Bishop, Winesham. Elsi held it in the time of King Edward, and gelded for ten hides. The arable is sixteen carucates. Thereof in demesne are four hides and there are three carucates, and twelve servants, and fifty villeins, with nine ploughs. There are two mills of twenty shillings rent, and six acres of meadow. Wood half a mile long and a furlong and a half broad." The money collected went to funding William's court and his army, which for some years was putting down rebellions and fending off the Welsh. To show their strength, the Normans also spent huge sums building churches and castles, many of which survive today. The only castle in our area was Croft Castle, near Crewkerne, which unfortunately does not survive. Baldwin de Redvers (earl of Devon) or perhaps his father Richard built it in the early 12th century. It was at "Castle Hill", just off the A30 on the Hinton St. George road. The day-to-day life of the village changed little: it was, from our point of view, a hard and narrow existence. Every man had to do "landservice", working on the lord's acres as well as cultivating his own strips. Houses were mostly single-room structures made of straw and mud on a wooden frame, where cooking, eating and sleeping all took place. There would have been very little light (rush candles and the cooking-fire) and clothes were minimal for keeping out the cold. Food was limited to local produce; the only drink was ale. No one could leave the manor without permission, and knowledge of the outside world almost nonexistent. Manors had to be self-sufficient except for materials such as iron and salt. The Normans imposed harsher rules than had prevailed in Saxon times. Kings and nobles were obsessed with hunting, so Forest Laws were imposed; no peasant, however hungry, could take game, and even dogs were cruelly punished if found chasing deer. Fines were heavily exacted for a wide range of crimes, and there were death duties to pay even for the poor. The Church itself changed. Norman bishops gradually replaced Saxon ones, making a distance between Church and people. Celibacy was strictly imposed, so that priests had to send away their wives. French was the language of the nobility and secular power, and remained so for three hundred years. It was Norman French, a distinct dialect, which is why our rich modern English often has two words each developed from separate French sources. Old English (or Anglo-Saxon) was the language of the peasants. It was the language of everyday life, and over two hundred of our commonest words today are almost unchanged from it: come, go, eat, drink, king, house, etc. It's often observed that we have different words for farm animals and their meat, the former from English, the latter from French (cow - beef, sheep - mutton). 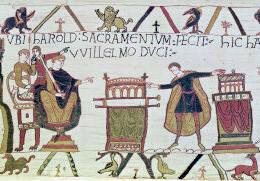 which seems to demonstrate that the English tended the animals while the Norman overlords ate them! During the Middle Ages (a period we loosely define as 1100 to 1500 AD) a society based on a strict ladder of obedience, loyalty and service continued, but gradually people's horizons expanded. Trade, travel, and wars are the engines of change. The crusades, for example, took many Englishmen into contact with an exotic culture, which, however much they despised it as "infidel", was more advanced in medicine, astronomy and technology. The most conspicuous event of the twelfth century near Winsham was the building of Forde Abbey, for this was the age of the great monasteries. Any man plodding behind his wooden plough, or woman spinning on a distaff in her doorway, must have seen ox-carts bringing in huge quantities of stone, and heard the ringing of axes as timber was felled in the surrounding woods. Abbeys had a wide influence, employing local people as lay-workers, promoting scholarship, and attracting travellers. Although set up to provide an enclosed monastic space, they were a link with the outside world. In the thirteenth century two events took place that figure large in history books, but would have made little impact on local people. 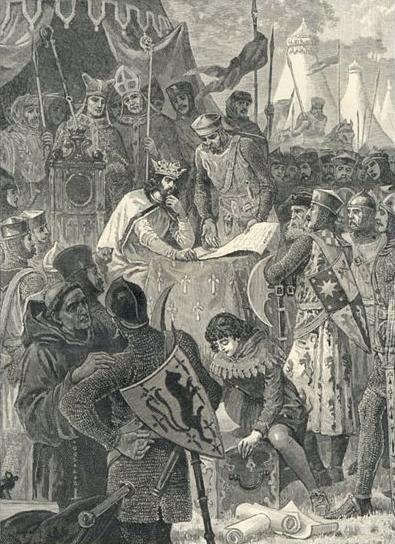 One was the signing of Magna Carta in 1215 by King John,( see picture) the other the setting up of the first "parliament" by Simon de Montfort in 1258. These are hailed as major steps towards democracy, but at the time only represented the struggle for power by the nobles against the king. Later in the century, however, Edward 1 summoned two representatives from each shire and each borough (town) to Westminster, and this was the beginning of the House of Commons. The reason of course, was to raise taxes from his wars against Wales, Scotland, and France. these towns, and some villages, were the centre of the wool trade, and wool was the staple of English trade throughout the Middle Ages. It would be a common sight at shearing time, to see trains of wagons or pack-ponies carrying the wool to the east and south coast ports for shipping to Flanders. At other times of year merchants would be travelling to inspect flocks and make deals with their owners. The long-staple wool of England was highly prized. In the fourteenth century came the devastating Black Death. This swiftly spreading incurable disease killed about a third of the population of Europe. It was a lucky village that escaped, and some were wiped out altogether. By reducing so drastically the number of labourers, the Black Death had profound results. Workers could demand payment in coin, breaking the bonds of landservice, and they began to travel widely in search of work. A stirring of awareness of their new power, and anger at the imposition of a universal Poll Tax, led to the Peasants Revolt in 1381. Men from Kent and Essex marched on London under their leader, Wat Tyler, who boldly made demands of the king himself (the young Richard II. Although Tyler was killed (by the Mayor of London) and Richard rescinded most of the concessions he had made, the Revolt struck an indelible blow for social equality. However long the news took to reach the West Country, its implications could not be ignored. At the same time, Geoffrey Chaucer was writing The Canterbury Tales, whose Prologue describes a spectrum of various occupations of men (and some women) in the England of his time. Witty and entertaining, Chaucer’s range of characters also demonstrated the corruption and self-interest that were leading to huge social change. In particular, the Prioress, Friar and Monk are not paragons of holiness, but pre-occupied with status, wealth and pleasure - emblems of all that was wrong with the Church. Most significant of all is that Chaucer wrote in English. He spoke and wrote in French also, but English was no longer confined to the peasant class. It was expanding, absorbing many French words, to produce almost the richness and subtlety it has today. Diverse dialects still existed, but Chaucer's English was that of the merchant class and of London, which predominated and became Modern English. Clearly many people could now read, and books and pamphlets could be copied and circulated. Reading is usually a private occupation, nourishing individual thought, and especially in one's own language, it is a threat to authority. The Church felt this most of all. John Wycliffe, was a contemporary and known to Chaucer. He began distributing pamphlets attacking the abuses of the Church (such as "indulgences") and even questioning its most vital doctrines. When he produced the first complete Bible in English, it was plain that a revolutionary movement in religious thought was taking place: the trend towards the rule of individual conscience, and the undermining of the rule of Pope and priest, in other words, the beginning of Protestantism. As Wycliffe's humble "hedge-priests" roved the countryside, they were the forerunners of that maelstrom of change, the Reformation. Throughout the fifteenth century, England continued to fight expensive wars. Kings struggled to hold on to English possessions in France, but where Henry V succeeded, later rulers lost everything except Calais. Wales was united under Owen Glendower, but was finally forced to submit to English rule. At home, the Wars of the Roses (the dispute over which noble house would claim the throne) was not really resolved until Henry Tudor defeated Richard III) at Bosworth. All this unrest meant high taxes, a huge demand for fighting men, and an even harder life for ordinary people in typical English villages. Ironically, just as Henry Tudor was about to establish the dynasty that would give comparative stability to England for the next hundred years, and introduce the increased trade, exploration, cultural advance and national pride that we associate with the sixteenth century, a new device had been set up in London that would transform life radically and for ever. This was the printing press. Caxton's first innocent publications, like "Stories of Troy" and "How to play chess" led to profound changes in society. Knowledge was no longer the prerogative of an elite: even the humblest had the incentive to learn to read. Printing stabilised the language, including spelling, cutting through social and geographical boundaries. It made possible on a wide scale the forward march of that most subversive of forces, the spread of ideas.